The Department of Primary Industries and Regional Development, WA has worked with the Indonesian potato industry to increase the productivity of their crops planted with WA seed potatoes. Improved productivity requires accurate identification of pests in potatoes as well as in the cabbage rotation crop. As well as helping Indonesian farmers this information will assist WA seed potato exporters understand the challenges their Indonesian customers face. The cluster caterpillar’s Indonesian name is 'ulat grayak' and its scientific name is Spodoptera litura. Cluster caterpillar larvae damage potato and cabbage crops by defoliating plants, resulting in reduced yield. This species is most abundant in subtropical and tropical regions. 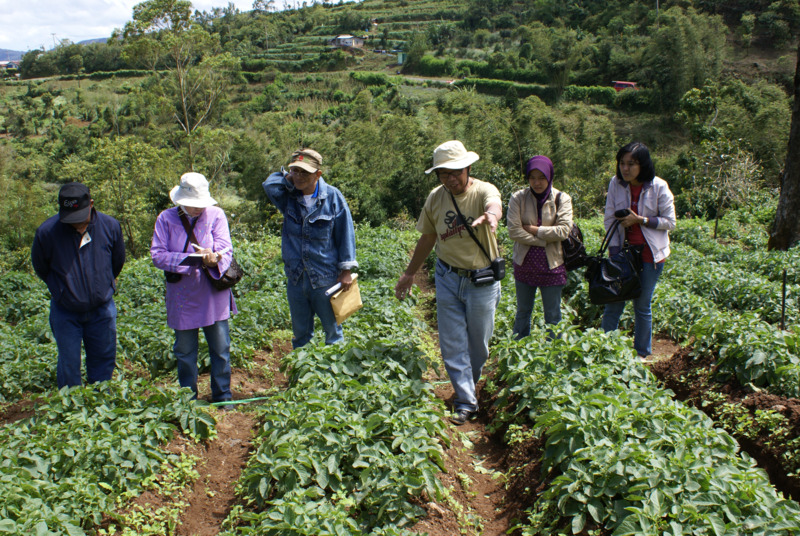 It is a relatively minor pest of potatoes in Indonesia. While this insect occurs in WA, it is not a common pest of potato and cabbage crops here. Cluster caterpillar moths are about 2cm long and 1.5cm wide with wings folded and about 4cm wide with wings extended. They have a criss-cross pattern of dark and light bands across the upper wings while the lower wings are white with a grey edge and veins. This pattern differs from that of other moth pests. Female moths are slighter larger than males, but both have the same colour and pattern on the wings. The moths are strong fliers and can invade crops from emergence or seedling transplanting, through to harvest. Moths lay egg masses which can contain up to 200 eggs. 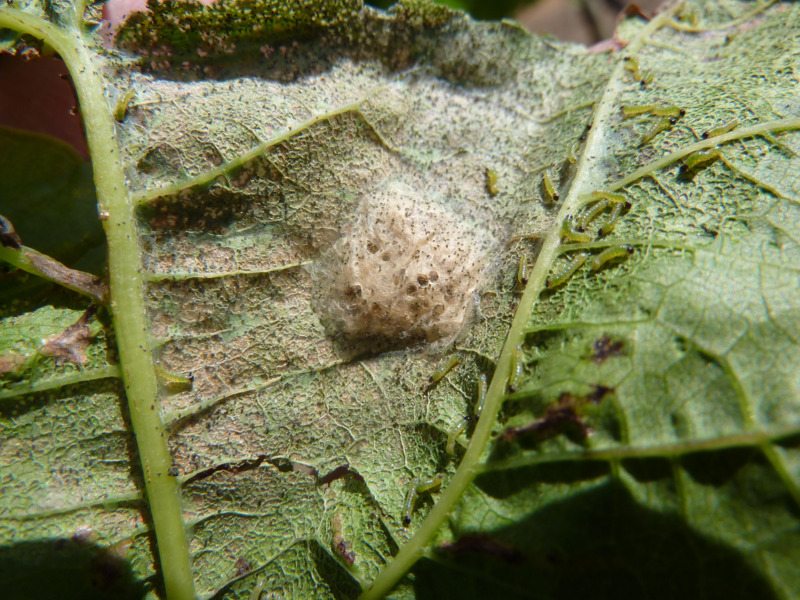 The egg mass is covered in scales and laid on leaves. All eggs within an mass hatch about the same time which has the result that many larvae are present feeding on one leaf - this is the reason for the insect's common name of cluster caterpillar. Feeding by clusters of early stage larvae causes a lace-like pattern on leaves. As larvae mature, they eat holes in leaves with only the main leaf veins remaining. Mature larvae are up to 5cm long. Larvae are smooth with no hairs. Young larvae are cream to green and as they mature, become grey. They have black triangles along each side of their back, with strips of pale grey and cream running the length of their body. They feed during both day and night. 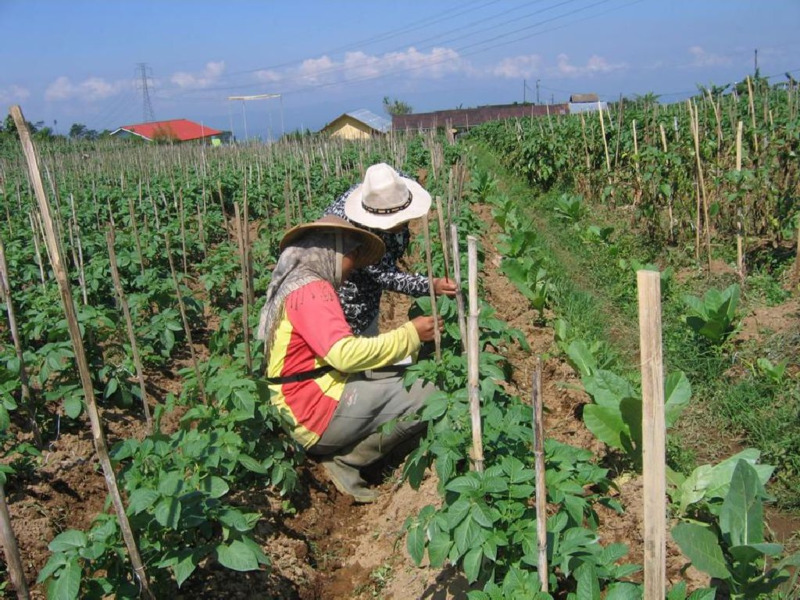 Defoliation of crops can occur quickly in hot weather. When mature, cluster caterpillar burrow into the soil and form a cocoon.